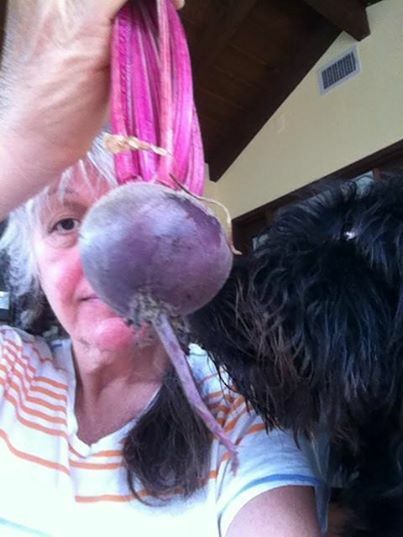 Hank and I examine the beet we grew. I grew up on that beach up there. My dad was US Navy, stationed in Rota, Spain in 1964, and that beach was outside my front door. The ocean surged into the living room during storms, the salt air ate the chrome off of our sky blue Oldsmobile, and I learned something profound living inside the sound of steady breaking surf. Like most privileged little kids, I had no idea that I was lucky. I love literature and consider myself a reader, but thanks to my early involvement with AP English Language, my career focus has been on expository nonfiction text. Teaching Expository Reading and Writing has only sharpened and refined this focus on nonfiction. This is a rich and largely unexplored area for many readers, and I enjoy introducing students to the many great contemporary writers in nonfiction (as I discover them myself). But in my view, even more exciting than reading is writing. (The two are inseparable.) Helping kids find confidence in their ideas on the page is a source of great satisfaction and great frustration. Teaching writing is hard and it’s complicated, yet it’s worth every effort. Writing well is within the grasp of anyone. It is not magic. It takes attention and work, and with time, it becomes more natural. Before I became a teacher, I worked in marketing and communications in a corporate setting. I wrote under the pressure of a deadline, and had to learn to stay within constraints of task, audience and purpose; in other words, first I helped to create “the company voice,” and then wrote to maintain that voice in all communications, internal and external. My boss was ruthless when it came to editing out any of my fanciful flourishes and personal quirks. At first, his edits hurt my feelings, but eventually I came to see that process as the great education that it was. When I became a teacher in my early 40s, I knew I had found my raison d’etre. The work is engaging and worthwhile. I see 175 students a day; every year I will ask every student to read, to write, to think, to collaborate, and to reflect — I want them to find their own boundary, and then push past it. It’s hard work for everyone, but we do it. It’s English Language Arts, baby. Making meaning of our lives through reading and writing, figuring out how to connect with big ideas by engaging with great thinkers, and expressing our truth in a way that others can understand. I can’t think of anything that matters more to all us: to the scientist, the activist, the mathematician, the historian, the philosopher, the mechanic, the builder, the healer. Learning from others, communicating what we have discovered, making sense of it all — this is the human enterprise. Sometimes, I regret that I am not a professional writer — especially when the alarm clock goes off so early, or when I find myself confronted by a huge stack of essays to deal with, or when a student stands before me, offering an excuse instead of work. But when I reflect on all of the great young people I know and have had the great privilege of working with, I know that I am where I belong. I reason that professional writers are writers who are paid to write, so I squint my eyes a little to fuzz the boundary, and discover I am exactly where I’ve always wanted to be. Except I do have to roll out of bed earlier than I like.